How old is Kingdom fungi? What use is Kingdom Fungi? Mushrooms follow an almost embryo-like developmental pathway. These are microscope images of sections cut right through the centres of developing fruit body 'initials' of the small inkcap mushroom Coprinopsis cinerea; the youngest is on the left of the panel. Early development of something like a mushroom looks very much like an embryonic process (scale bar = 1 mm), but remember that fungi are clonal organisms and these objects are fruit bodies, and many of them may be produced by an individual mycelium over an extended period of time. These images are photomicrographs of light microscope sections of successive stages in the very early development of the fruit body of the ink cap mushroom, Coprinopsis cinerea. The mature fruit body is approximately 100 mm tall, so this sequence covers just the first 1% of its developmental programme. The sections have been stained with the periodic acid-Schiff reagent, which stains polysaccharide accumulations blue-purple; in this case the polysaccharide, identified by other analyses, is glycogen. The object at extreme left is a large hyphal tuft, at second left is an initial (it shows some internal compaction and differentiation and can become either a sclerotium or a fruit body, depending on environmental conditions). 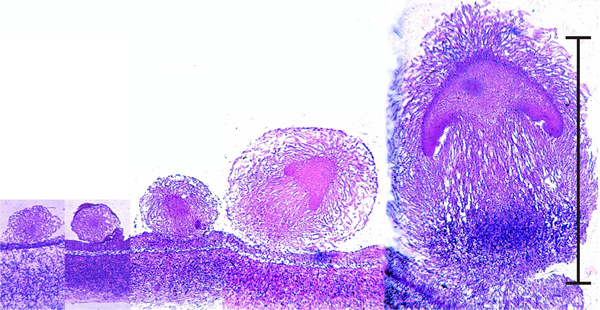 Note that the third section is obviously differentiated into cap-like and stem-like structures, even though it is only 300 μm tall, and this is even more evident in the fourth section (700 μm tall), which has young gills but no gill cavity. 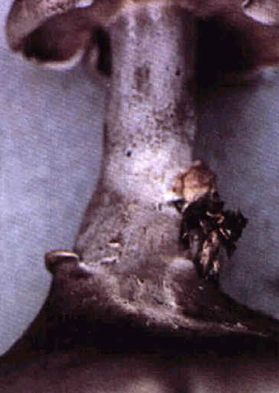 At extreme right is a 1.2-mm tall fruit body primordium, in which the basic ‘body plan’ of the mushroom is complete with clear demarcation into veil, pileipellis (i.e. cap epidermis), cap, gills (with the beginnings of an annular gill cavity), and stem (with a distinct stem basal bulb which features heavy accumulations of glycogen). You can see that a 'young mushroom' is clearly established well before the initial reaches one millimetre high. The mature mushroom will be 100 mm tall, so this is a tiny embryo by comparison. a fungal kind of programmed cell death. But there are differences. For example, hyphal cells require continuous reinforcement of their differentiation 'instructions'. This reinforcement is part of the context within which they normally develop and if they are removed from it then most differentiated fungal cells can revert to being undifferentiated hyphae (Chiu & Moore, 1988a & 1988b). Remember that mushrooms not individual organisms. Mushrooms are appendages (literally 'fruits') of their mycelium. In fact, fungi are 'modular organisms', like clonal corals and vegetatively-propagated plants. Andrews, J. H. (1995). Fungi and the evolution of growth form. Canadian Journal of Botany, 73: S1206-S1212. Harper, J.L., Rosen, B.R. & White, J. (1986). The Growth and Form of Modular Organisms. London: The Royal Society. 250 pp. ISBN-10: 0521350743, ISBN-13: 978-0521350747. View on Amazon. are under separate physiological control. When played out in their correct arrangement, ‘normal’ morphology is obtained. Subroutines may be disabled genetically or through physiological stress. If some subroutines are disabled, an abnormal morphology (known as a 'polymorphism') results. Polymorphic fruit bodies of Volvariella bombycina. A is the normal morphology, of a typical agaric mushroom, which is characterised by a well-developed enclosing volva through which the mushroom cap emerges during development (bulbangiocarpic development); scale bar = 20 mm. B to G illustrate a few of the polymorphisms that have arisen on otherwise normal cultures, though often seeming to be associated with some environmental stress, such as abnormal temperature and/or desiccation. B is apparently normal, but completely lacks the volva despite this being characteristic of the genus; scale bar = 5 mm. C, a gymnocarpous fruit body with a grossly enlarged basal volva; scale bar = 2 mm. D, a fruit body with a sinuous extra hymenium formed by the proliferating margin of the cap curling onto the upper surface of the cap; scale bar = 10 mm; E is a scanning electron microscope (SEM) view of specimen D and shows the well-developed gills on the upper surface of the cap; scale bar = 1 mm. F, a fruit body in which hymenium has formed all over the outer surface of the club-shaped fruit body; scale bar = 5 mm; G is an SEM view of the bisected fruit body and shows that the labyrinthine hymenophore covers the entire surface of the club-shaped ‘pileus’; scale bar = 0.5 mm. This polymorph is called ‘morchelloid’ because of its resemblance to the normal fruit body of the morel (Morchella), which, of course, is a member of the Ascomycota! Photomicrographs by Professor S.W. Chiu, Chinese University of Hong Kong; illustration modified from Chiu et al., 1989. 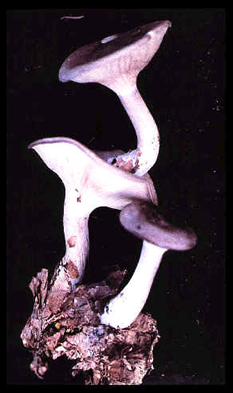 The Volvariella bombycina polymorphisms shown above were produced in the laboratory (probably in response to desiccation stress), but developmental abnormalities are also commonly observed in nature. Photos by H. van der Aa: from Mycologist, 11: 80-82. 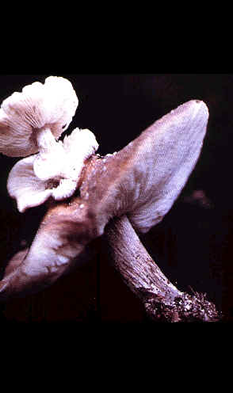 The close up at bottom right of the panel above shows how one fruit body of Clitocybe nebularis has burst out of the internal tissues of its twin. For some reason, the upper fruit body formed in a completely inappropriate position - within the cap of a pre-existing fruit body. In these examples, the subroutines for fruit body initiation and development were put into effect in the wrong place and at the wrong time, but they otherwise gave rise to an essentially normal morphology. The Volvariella bombycina examples include a Morchella-like fruit, an inverted cap and a club-shaped fruit body, showing that 'fruit bodies' very different from the normal morphology can be produced. Developmental errors are not limited to fungi: 10 to 15% of human embryos suffer major malformations (defined as primary errors of development) soon after conception - the majority are aborted. About 0.7% of newborns have multiple major malformations, about 3% have one major malformation and 14% have a single minor malformation. 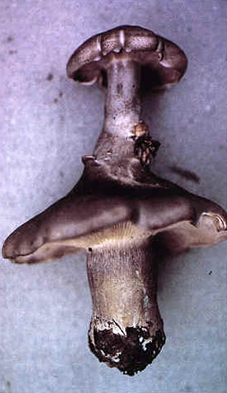 The difference with fungi, is that most of the abnormal fungal fruit bodies still produce spores. That is, they are still functional. It seems that fruit body abnormalities in fungi demonstrate their flexibility in expression of their developmental subroutines in ways that allow the fruit body to react to adverse conditions and still produce a crop of spores. I call this tolerance of imprecision. Fungal fruit bodies can tolerate imprecision of their development, and this ability to tolerate uncertainty in development is what makes the fungi so successful. The main features of fungal developmental biology have been summarised as a set of principles by Moore (2005) [CLICK HERE to download the full text]. The list combines most of the observations discussed above. It starts with the reminder that in many fungi hyphae differentiate from the vegetative form that ordinarily composes a mycelium and aggregate to form tissues of multihyphal structures. These may be linear organs that emphasise parallel arrangements of hyphae, such as strands, rhizomorphs and fruit body stems; or globose masses that emphasise interweaving of hyphae, such as sclerotia, fruit bodies and other sporulating structures of the larger Ascomycota and Basidiomycota. Principle 1: the fundamental cell biology of fungi on which development depends is that hyphae extend only at their apex, and cross-walls form only at right angles to the long axis of the hypha. Principle 2: fungal morphogenesis depends on the placement of hyphal branches. Increasing the number of growing tips by hyphal branching is the equivalent of cell proliferation in animals and plants. To proliferate, the hypha must branch, and to form an organised tissue the position of branch emergence and its direction of growth must be controlled. Principle 3: the molecular biology of the management of cell-to-cell interactions in fungi is completely different from that found in animals and plants. Principle 4: fungal morphogenetic programmes are organised into developmental subroutines, which are integrated collections of genetic information that contribute to individual isolated features of the programme. Execution of all the developmental subroutines at the right time and in the right place results in a normal structure. Principle 5: because hyphae grow only at their apex, global change to tropic reactions of all the hyphal tips in a structure is sufficient to generate basic fruit body shapes. Principle 6: over localised spatial scales co-ordination is achieved by an inducer hypha regulating the behaviour of a surrounding knot of hyphae and/or branches (these are called Reijnders’ hyphal knots). Principle 7: the response of tissues to tropic signals and the response of Reijnders’ hyphal knots to their inducer hyphae, coupled with the absence of lateral contacts between fungal hyphae analogous to the plasmodesmata, gap junctions and cell processes that interconnect neighbouring cells in plant and animal tissues suggest that development in fungi is regulated by morphogens communicated mainly through the extracellular environment. Principle 8: fungi can show extremes of cell differentiation in adjacent hyphal compartments even when pores in the cross-wall appear to be open (as judged by transmission electron microscopy). Principle 9: meiocytes appear to be the only hyphal cells that become committed to their developmental fate. Other highly differentiated cells retain totipotency - the ability to generate vegetative hyphal tips that grow out of the differentiated cell to re-establish a vegetative mycelium. Principle 10: in arriving at a morphogenetic structure and/or a state of differentiation, fungi are tolerant of considerable imprecision (i.e. expression of fuzzy logic), which results in even the most abnormal fruit bodies (caused by errors in execution of the developmental subroutines) being still able to distribute viable spores, and poorly (or wrongly) differentiated cells still serving a useful function. Principle 11: mechanical interactions influence the form and shape of the whole fruit body as it inflates and matures, and often generate the shape with which we are most familiar. Given the apparent similarities in the developmental strategies of animals plants and fungi it is natural to ask the question "do these very different organisms share the same (or similar) genetic controls of development. We have made an initial search for developmental gene sequences that suggested the idea that control mechanisms of fungal multicellular developmental biology are probably very different from those known in animals and plants. In this initial study a quick comparison was made of genomes of the saprotrophic Coprinopsis cinerea and Phanerochaete chrysosporium, and several other Basidiomycota and Ascomycota, using searches for developmental sequences known from the annelid worm Caenorhabditis elegans and the fruit fly Drosophila melanogaster (Moore et al., 2005)[CLICK HERE to download the full text]. In this study the fungal genomes were searched for homologues of sequences of the animal signalling mechanisms known as Wnt, Hedgehog, Notch and TGF-β, all of which are considered by animal developmental biologists to be essential, and highly conserved, components of normal development in all animals. None of these sequences were found in the fungal genomes (they also proved to be absent from plants). and the entire list included under ‘Fungi’ (141 genome sequences). To make such a job possible, you need automatically running web agents, which are reusable programming modules that interact with the Internet seeking user-defined goals; for example ‘get the sequence data’, ‘get the taxonomy information’ or ‘get the similarity search results’, etc. The agents were created using an application called Sight, which is a Java-based software package that provides a user-friendly interface to generate and connect web robots for automatic genomic data mining (visit http://bioinformatics.org/jSight/). The web agents retrieved the appropriate sequences from the GO database, retrieved information about them from other databases and then submitted those sequences to search for similarities in all the genomes recovered from the NCBI databases. In total the web agents accomplished an estimated total of 590,000 similarity searches across all available genomes for the 552 developmental sequences recovered from the GO database. If you were doing that number of searches yourself by hand you would have to complete 100 searches a day, doing one search every 15 minutes for 24 hours a day, 7 days a week, to complete the job in under 16 years! That’s why software automation is important. none of the sequences involved in animal or plant multicellular development can be found in the genomes of fungi. No sequences were strictly fungus specific, but 68 occurred only in plants and 239 occurred only in animals. True homology was limited to 78 sequences involved in the architecture of the eukaryotic cell. It is crucial to the interpretation of data mining results like this that BLAST outputs the statistical significance of any matches it finds. Thus, the statements above of the sort ‘none of the sequences…can be found’ really means that the software reported that all of the matches it found were statistically not significantly different from random sequence similarities. This statistical analysis feature provides the confidence for the statements that in fungi there are no Wnt, Hedgehog, Notch, TGF or p53 sequences, all of which are crucial to animals; nor were there any SINA or NAM sequences, which are crucial to plant multicellular development. The overwhelming majority of highly similar matches found in this survey proved to be between sequences involved in basic cell metabolism or essential eukaryotic cell processes; enzymes in common metabolic pathways, many transcription regulators, binding proteins, receptors and membrane proteins. What is lacking is cross-kingdom similarity in the ‘higher-management’ functions that integrate these nuts and bolts of eukaryotic cells to make tissues, organs and organisms. Overall, these studies suggest that there are no resemblances between the crown group of eukaryotic kingdoms in the ways they control and regulate their developmental processes. The unique cell biology of filamentous fungi has clearly caused control of their multicellular development to evolve in a radically different fashion from that in animals and plants. At the moment, unfortunately, we are totally ignorant of the way fungi regulate their multicellular development. Though we have the tools to study this. second, fungi, animals and plants are sister groups of eukaryotes that separated from one another phylogenetically at a single-cell grade of evolution, so they have evolved their developmental controls independently of each other and the molecular details of their developmental regulation are quite different. Read more about all this in the textbook 21st Century Guidebook to Fungi. The book brings together for the first time the full scope of fungal developmental biology, providing a coherent account which will be the basis for research in the future. The treatment also releases fungal morphogenesis from the confines of mycology, showing how and why this eukaryotic Kingdom deserves to be in the mainstream of developmental research. The author's view is quite simply that if you are ignorant of fungal morphogenesis then your understanding of developmental biology is incomplete. The book is aimed at all biologists. Throughout, the author blends together physiological, biochemical, structural and molecular descriptions within an evolutionary framework, combining the older literature with the most recent. A comprehensive description of fungi is not attempted, though sufficient information is provided about fungal biology to give the general reader a rounded view of the mycological context within which fungal morphogenesis is played out, without obscuring the broader biological significance. Jargon is avoided, technical terms demystified and a reader with knowledge of basic biology should not need to bring any other knowledge with him/her, nor need to refer elsewhere, in order to appreciate fungal morphogenesis. The first chapter is an overview of the evolutionary origins of fungi and the central role they played (and still play) in the evolution of life on Earth. 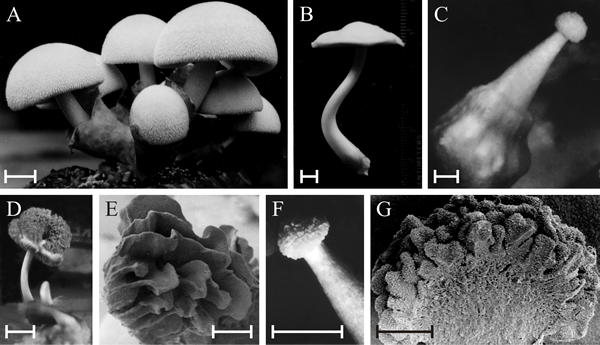 The second chapter introduces hyphal growth, the essence of the fungal life style, and identifies features which are crucial aspects of morphogenesis. Chapter 3 summarises fungal primary and secondary metabolism, necessary here because adaptation of primary metabolism and exploitation of secondary metabolism are both critical to fungal morphogenesis. the genetic components of differentiation and morphogenetic change being dealt with in chapter 5.
the ideas developed here are brought together and summarised in the final chapter 7. 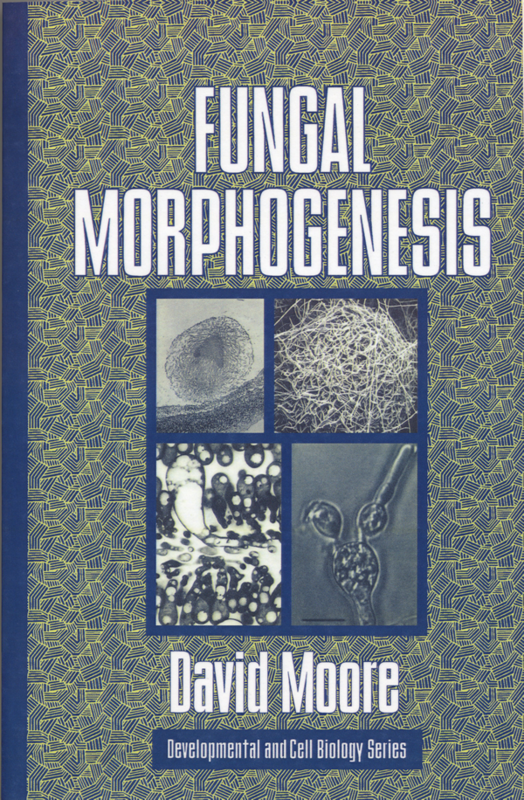 Fungal Morphogenesis was well received on publication in hardback, indeed it appeared in the Top-ten Best Sellers list in the Professional Titles, Biology category produced by Yankee Book Peddlers for the 4th quarter of 1998. The book was republished in paperback in 2003 and was republished online in 2010. It is still, even in 2011, the only book that deals comprehensively with the multicellular developmental biology of fungi.